All professionals working in health care settings need to understand and be prepared to answer questions about advance care planning. Ideally everyone over the age of 18 should talk about and document preferences. A healthcare crisis can happen to any person, of any age, due to a sudden illness or accident. Effective Advance Care Planning Fundamentals teaches all health practitioners and professionals the terminology and “tools” involved in advance care planning. The Coalition for Compassionate Care of California in partnership with The California State University Institute for Palliative Care created this self-paced online course to help organizations prepare all employees and volunteers to discuss the benefits of advance care planning with patients and family caregivers. Click HERE to get the Brochure and join the interest list! …working in primary care, acute care, long-term care, and home and community-based settings. Why have ACP Conversations? What do Healthcare professionals need to know before starting ACP? 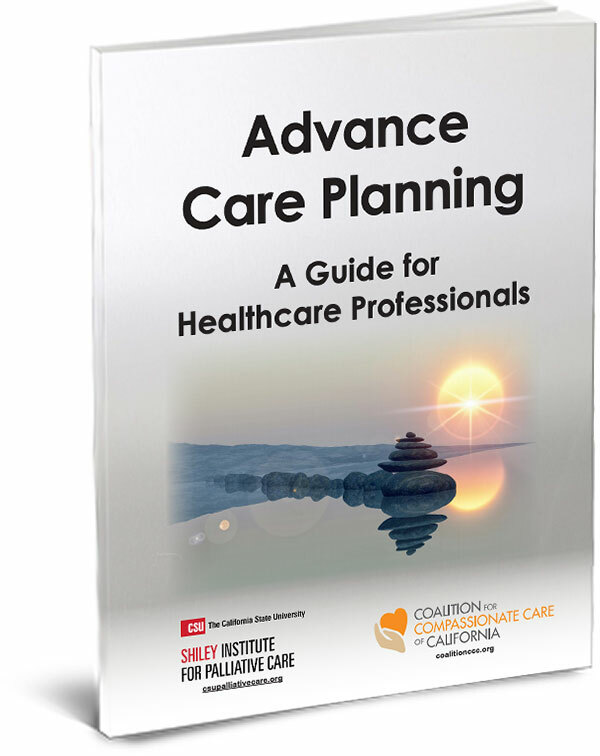 Download Your FREE Advance Care Planning Guide Here. Get your guide to starting and continuing Advance Care Planning conversations for better patient outcomes and satisfaction. Download Your FREE Guide here. Over 50% of physicians surveyed are uncomfortable having Advance Care Planning discussions. Download this FREE eBook and learn how to have more effective conversations with patients and families. How can physicians properly bill for having Advance Care Planning conversations? Learn how in this FREE ACP Guide for Healthcare Professionals. Confused about when and how to get reimbursed for ACP conversations? Download this FREE guide and learn more. Advance care planning involves the development of an informed plan regarding the care that an individual would or would not want in the event they become unable to communicate their healthcare choices in the future. 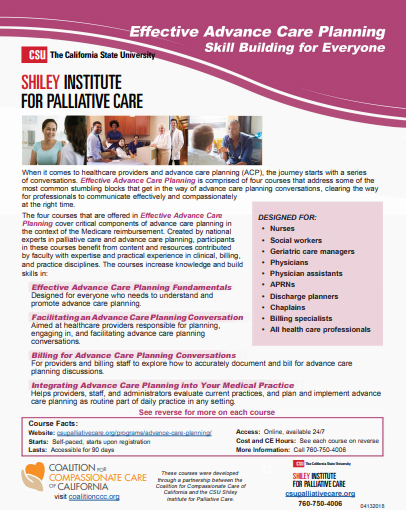 Effective Advance Care Planning Fundamentals provides a comprehensive overview of advance care planning that can be used to orient and train all staff regarding the importance of documenting care preferences. The course begins by presenting a variety of perspectives regarding advance care planning depending upon a person’s health status and personal values. Participants will learn how to describe the benefits of advance care planning and explain the terminology that often confuses professionals, patients, and family caregivers. The advance care planning process and the forms used to document care choices are described. Individuals will also have the opportunity to engage with case vignettes to apply their knowledge under a variety of care scenarios. Judy Thomas, JD, is the CEO of the Coalition for Compassionate Care of California (CCCC), and an attorney who has worked in healthcare for more than 20 years. Before working with the CCCC, Judy was a lobbyist for LeadingAge of California and the California Hospital Association, where she focused on aging and long-term supports and services. She was formerly a partner in the Sacramento-based law firm of Hunter, Richey, Di Benedetto & Brewer, where she specialized in healthcare law. And before law school, Judy was a computer programmer for the nation’s first preferred provider organization. Judy is the Chair of the National POLST Paradigm Task Force and Past President of the California Culture Change Coalition. Lael C. Duncan, MD, is a licensed California physician with more than 15 years of clinical practice in internal medicine, infectious disease, and long term acute care for patients with multi-system disease. Before joining the Coalition for Compassionate Care of California (CCCC) in 2014 as Medical Director of Consulting Services, Lael served the organization for four years as a passionate volunteer. After graduating with honors from the University of Washington Medical School in 1991, Lael did her residency training at Dartmouth Hitchcock Medical Center. She is board certified in both Internal Medicine and Infectious Diseases. Lael has practice experience with inpatient and outpatient care, hospital epidemiology and infection control, long term care, and rehabilitation following critical illness. Shirley Otis-Green, MSW, ACSW, OSW-C, is the Clinical Director of Consulting Services with the Coalition for Compassionate Care of California, a Research Consultant for the Psychosocial Oncology Specialization Program at the University of Louisville, Kent School of Social Work, and the founder of Collaborative Caring. Shirley’s education, research and consultation efforts focus on quality-of-life, palliative care, leadership development and the creation of meaningful organizational change. Her work is dedicated to enhancing excellence in the delivery of culturally-congruent, person-centered and family-focused inter-professional care through the implementation of effective learning principles. She has been the principal investigator on studies with over $3.3 million in external funding, including the ACE Project and ExCEL in Social Work. Her work has been recognized with numerous awards and disseminated through more than 100 publications and 400 professional presentations. Shirley serves on several editorial board, including the Journal of Palliative Medicine, and professional boards, including the National Association of Social Work. She is a Distinguished Social Work Practitioner in the National Academies of Practice, and is co-editor of the Oxford Textbook of Palliative Social Work.